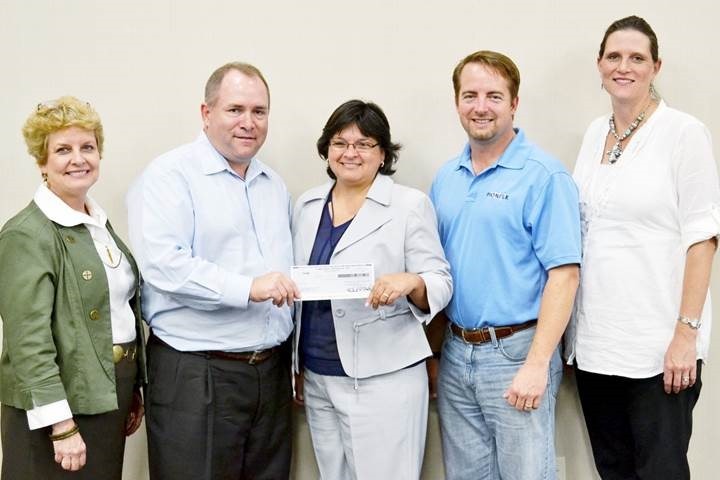 From left to right: Rhonda Fotiades, Senior Public Affairs Specialist for Pioneer Natural Resources; Joey Hall, Vice President of South Texas Operations for Pioneer Natural Resources; Dr. Beatriz T. Espinoza, Coastal Bend College President; Vance Hazzard, Vice President of Operations for the South Texas Asset Team for Pioneer Natural Resources; and, Christy Lansford, Coastal Bend College Foundation Executive Director, gather at the grand opening of Pioneer Natural Resources’ new field office in Pawnee, Texas on Wednesday, June 5. At the grand opening event, Pioneer Natural Resources presented Coastal Bend College with a $25,000 donation to help support oil and gas technology initiatives at the college. This marks the third year that Pioneer has donated to CBC for a total of $75,000 donated since 2011. For more information about how you or your company can help support CBC workforce programs, please contact Christy Lansford at (361) 354-2447 or via email at foundation@coastalbend.edu. For information about workforce programs and courses, please contact an advisor at (361) 354-2266 or visit your local CBC location.